Have you noticed the vast amounts of sequels, prequels, and remakes that have recently been hitting our cinemas? I swear almost every second film currently wasting aisle space at my local video store is nothing but a dodgy addition to an already tired series of films. Are the stories true, has Hollywood really lost all of its originality and creativity? What is worse still though are the shelves after shelves of straight-to-video releases which are nothing but low-budget remakes or sequels to previously successful high-budget films. Some of them have their merits and stand up in their own right, but the clown that thought of making a sequel to American Psycho must have been just as mad as the fictional Bateman himself. Not content on riding on the success of the first film, American Psycho II decides to place more emphasis on the pop-rock soundtrack than it does on the progression of the actual storyline. 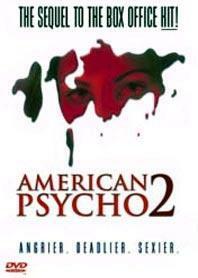 Remaking American Psycho for the kids goes down in my books as the worse idea for a film since Spiceworld: The Movie. In the words of Mr. T., “I pity the fool” responsible for this trash. The storyline is as thin as the lead character, so I might as well run it by you. Rachael Newman may on the outside look like your typical trendy college student, studying hard and being disturbingly anti-social. However deep inside Rachael has a hidden past – she was the one who put Patrick Bateman (the original American Psycho) in his grave. The film basically runs as her internal monologue as she strives to gain the teacher's assistant position with her favorite college lecturer (played by William Shatner no less). This of course involves her killing any and every clichéd character that gets in her way, and that is the entire storyline. If you like seeing a pretty, but insanely twisted, little girl stab a lot of innocent people then this is the film you’ve been looking for all your sad, sad life. If you are expecting a film as nearly as smart or as intelligent as the first then you're reading the wrong review my friend. I’ve already said the film is terrible, do you really want to know about the transfer? Well there is some good news in this department. The video transfer is quite fine for a cheapy-cheap straight-to-video release. Presented with a widescreen enhanced aspect ratio of 1.85:1 the detail is sharp, the colors are well rendered, and grain is at a minimal. Aliasing is pretty common and film artefacts are frequent. Overall, however, the transfer has come up looking quite fine and does this film more justice than it deserves. The audio is also rather impressive considering the film's second-rate nature. The film is mostly dialogue and comes through sounding clear at all times. The few sound effects available also play well through the surrounds and the subwoofer. There is a Dolby Digital 5.1 soundtrack as well as a Dolby Digital 2.0 surround soundtrack and two Dolby Digital 2.0 stereo soundtracks for the audio commentaries. All are of reasonable quality and do all that is required for this pathetic excuse for a film. Of all the releases available at the moment, this is the disc they choose to fill up with lots of extras! We have two audio commentaries, neither interesting (one in fact is just flat out annoying). There is also a Theatrical Trailer, an Alternative Opening, some Deleted Scenes, and a few unflattering Outtakes. These are all dull and utterly worthless. I’m thankful that the director chose to cut the film down to 85 minutes rather than leaving all these extra scenes in and blowing it out to a full two hour presentation.